Wild Camargue horses of France grazing in the high grass. 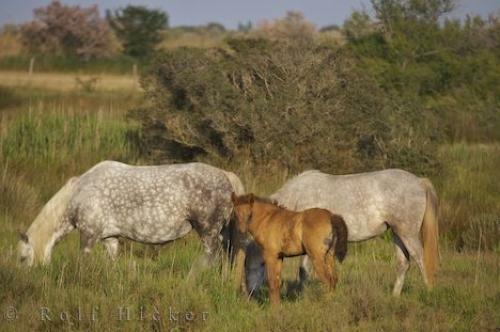 Photo of wild horses and foal in Parc Regional de Camargue in Provence, France, Europe. ... Camargue Horses and foal, Equus caballus, in Plaine de la Camargue, Parc Naturel Regional de Camargue, Camargue, Bouches du Rhone, Provence, France, Europe. I photographed this photo with the digital SLR camera model Canon EOS-1Ds Mark II, aperture of f/5.6, exposure time of 1/250 sec. on ISO 100, as always I used a original Canon Lens, the focus lenght for this picture was 300mm.